Inspire your partner’s confidence with a diamond that exemplifies sophistication and exuberance. A distinctive diamond with historical charm and new-age glamour, the emerald-cut stands out from the crowd with a uniqueness all its own. The emerald-cut diamond rose to popularity during the Art Deco period, and its shape exhibits the fine craftsmanship and rich materials the period is known for. What is an Emerald-Cut Diamond? The emerald-cut is a rare and dramatic shape with enviable Old World charm. At its essence, the emerald-cut is rectangular in shape with cut corners. This diamond shape also features a characteristic wide, flat plane that looks like stairs when viewed from the top. 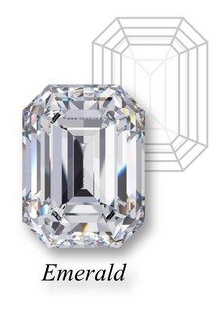 As a result, the emerald-cut is often referred to as a “step-cut”. Emerald-cut diamonds are comprised of either 57 or 58 facets. The number of facet rows on the crown or pavilion of the emerald-cut varies in number, altering the total facet number. As with all diamond shapes, the emerald cut presents a trade-off: its rectangular shape does not sparkle as brightly as other shapes but does create the exquisite “Hall of Mirrors” effect with long, dramatic lines and an unmatched elegant allure. Emerald-cut diamonds prove quite rare and are more difficult to find. In fact, emerald-cut diamonds represent only 3 percent of the world’s diamonds. What’s more, their rarity also means that emerald diamonds tend to cost more than other diamond shapes. However, to help balance out the higher price, the emerald-cut shape creates the illusion of being larger than other diamond shapes per carat. Despite their rarity, emerald-cut diamonds have actually gained popularity in recent years as A-list celebrities began favoring this extraordinary shape. Do emerald-cut diamonds look bigger? Due to its large surface area, the emerald-cut does appear much larger per carat compared to other diamond shapes. Along with its larger appearance and elegant feel, an emerald-cut's elongated lines make the wearer's fingers appear longer and slimmer. If you and your partner favor a stone with a larger appearance and a distinctive, elegant look, the emerald-cut might be your ideal shape. What Do I Look for When Buying an Emerald-Cut Diamond? Emerald-cut diamonds feature large, open facets and a wide table. This wide palette makes inclusions and clarity issues more visible versus other diamond shapes. For this reason, we recommend selecting an emerald-cut diamond with a higher clarity grade to ensure that your stone looks completely clean to the naked human eye. What is the Best Setting for an Emerald-Cut Diamond? Among diamond shapes, emerald-cut diamonds are highly versatile and marry well with a variety of jewelry settings. Solitaire Settings: offer an elegant simplicity that helps your emerald-cut diamond stand out even more. Halo Settings: help create a beautiful sparkle that enhances the vintage feel of your emerald-cut diamond. No matter what setting you prefer, an emerald-cut diamond always looks distinctively stunning. Its versatility also makes it the ideal cut for custom jewelry pieces. There is currently no industry-wide consensus for what exact cut parameters create the perfect emerald-cut diamond. Because preferences are very subjective when analyzing emerald-cut diamonds, we generally recommend visually inspecting an emerald-cut diamond prior to purchase. Every diamond is measured using the carat weight system. GSL uses specially calibrated scales to ensure an accurate measurement with weights measured to the hundred-thousandths of a carat. In the carat system, one metric carat is equal to 0.2 gram. Similar to the oval shape, emerald-cuts tend to have a larger physical appearance for their carat weight when compared to other diamond shapes. The industry standard diamond color grading system ranges from D grades (colorless), continuing alphabetically with increasing levels of color to Z grades. The diamond industry uses master stones in order to grade diamond color. GSL holds the rigorous test standards, using master stone sets that pass these tests prior to use. With emerald-cut diamonds, you can often more easily see diamond body color due to large, open facets in the diamond shape. With that in mind, we strongly recommend that you pay special attention to the color of the diamond when shopping for emerald-cuts. Diamond clarity refers to the appearance of the stone – including any blemishes or inclusions. The GSL grades square diamond clarity as one of six grades: Flawless, Internally Flawless, Very Very Small Inclusions, Very Small Inclusions, Small Inclusions, or Imperfect. Evaluating an emerald-cut diamond clarity is subjective (just like evaluating color). Because of the nature of the wide, flat table of an emerald-diamond, clarity tends to be especially important with this diamond shape. Often, inclusions are easier to see with emerald-cut diamonds. As such, we recommend selecting a higher clarity when shopping for this diamond shape. The large majority of emerald-cut diamonds have a length-to-width ratio between 1.30 to 1.50. If you prefer a more square shape, select a diamond with a lower ratio. If you want something more rectangular, choose a diamond with a higher ratio. We recommend analyzing a variety of emerald diamonds to determine your preferred ratio. The emerald-cut shape dates back to the 1500’s as one of the first cuts used in fine jewelry pieces. Originally, stonecutters used the shape for cutting true emeralds (hence the name of the diamond cut). Experts at the time found that true emeralds were soft and prone to breaking, but the stepped facets of the emerald-cut helped to give them increased stability. Though the exact origin of the emerald-cut remains uncertain, the term “emerald-cut” first became popular in the Art Deco period of the 1920’s. The shape’s unclear origins are partially due to the fact that the emerald-cut was seen more as a tool known by a variety of names in the context of cutting emerald gems. Art Deco diamond cutters soon realized that the shape also lent itself well to diamonds. Though rare, celebrities like Beyoncé, Amal Clooney, and Angelina Jolie have helped bring this bold-yet-elegant shape back into the public eye in recent years. If you or your partner demands a distinct diamond shape with vintage charm, the emerald-cut may be the ideal diamond choice. For centuries, diamond cutters and wearers alike have celebrated the rectangular “stepped” shape of the emerald-cut diamond for it’s mesmerizing “Hall of Mirrors” effect and larger appearance. Only accounting for 3 percent of diamonds worldwide, the emerald-cut is a rare shape popular in one-of-a-kind fine jewelry pieces. The wide, flat plane of the emerald-cut’s shape highlights the clarity and natural beauty of a rectangular diamond. With unmatched versatility, the emerald-cut suits an array of settings, making it a highly customizable and as unique as your taste. For a unique diamond shape with the Old-World charm of the Art Deco period, explore the Zales selection of exquisite emerald-cut diamonds.